This eight-part 2006 survey of technology experts and social analysts inspired thousands of fascinating forecasts tied to eight compelling question sets about the state of things in 2020, including: Will English be the dominant language? Will more people choose to live "off the grid"? Will virtual reality trump "real" reality? Will autonomous machines leave humans out of the loop? Will national boundaries be displaced by new groupings? This web-based survey of 742 internet stakeholders asked to assess provocative proposed scenarios for the year 2020 found significant support for and against each. The point of this non-random survey was to add focused input to the ongoing conversation about the future of the internet; respondents' written elaborations were the most valuable result of the study. The final statistics revealed by the quantitative survey data show the agree/disagree split fell within 3 to 15 percentage points on five of the questions - an indication that the complexity of issues tied to the internet make it difficult to predict what we can expect to see in the next 15 years. Among the results: 57% said English will not crowd out other languages on the internet; 58% said people who don't participate in digital communications networks will form their own cultural group that self-segregates from "modern" society; 56% said while online virtual reality will foster workplace productivity, it will lead to serious addiction problems for many; 54% said autonomous networked technology will not move beyond human control by 2020. Most respondents - 78% - identified building network capacity and the knowledge base to help people of all nations use it as the first or second priority for the world's policymakers and technology industry to pursue. Respondents were asked to agree or disagree with each of a set of eight scenarios, and they were given the opportunity to elaborate on their answers. The scenarios – woven from data collected in recent industry and research reports and predictive public statements by leaders in science, technology, business, and politics – were provocatively constructed and layered with overlapping elements to spur discussion and an illumination of issues. The agree-disagree aspects of the survey yielded useful quantitative numbers; the respondents' elaborations attached to each answer yielded significant qualitative information, adding many more predictions to the Imagining the Internet site. A savvy, international sample was sought for the survey. At least one fourth of the respondents are involved with internet leadership organizations such as the Internet Society, the World Wide Web Consortium, the United Nations' Working Group on Internet Governance, Internet2 and others. About one fourth of the respondents said they live in a part of the world other than North America. More than half of the respondents began using the internet prior to the days of its general acceptance - starting their online activities in 1992 or earlier - and 12 percent have been internet users since 1982 or earlier. Participants include people from the Internet Society, VeriSign, BBN Technologies, Fing, Yahoo Japan, France Telecom, the International Telecommunication Union, Nanyang Technological University, the Electronic Frontier Foundation, MIT, AfriNIC, Qualcomm, Electronic Privacy Information Center, Nortel, Disney, Harvard, RAND, IBM, Austrian Academy of Sciences, Sony, Google, Telematica Instituut, Habitat for Humanity, Cisco, Greenpeace, AT&T, Jupiter Research, CNET, Microsoft, Intel, ISTOE Online, Amazon.com, Universidad Nacional Autonoma de Mexico, Sprint, Intuit, HP Laboratories, Centre for Policy Modelling, ICT Strategies, Bipolar Dream, the Benton Foundation, Semacode, Widgetwonder, Warner, Hearst, Imaginova, CNN, Adobe Systems, Forrester Research and many other top groups. "Hopes and Fears: The Future of the Internet II" is a book-length version of the survey data, now available from Cambria Press. Its 484 pages include an expanded look at the survey data and a comprehensive set of expert responses on all of the cutting questions addressed in this study. 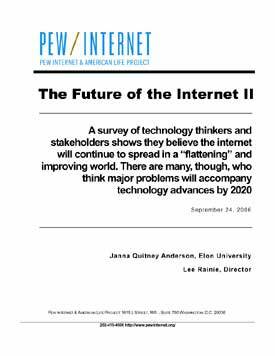 To see the report of results, click here for a PDF of the official Pew Internet & American Life report on the 2006 Predictions Survey. Much more detailed responses are available on this site at the links below. 10 more links: To read supplemental information not contained in the official report - including a large selection of the thousands of fascinating written responses by internet stakeholders to each of the survey's scenarios - look at the listing below and click on a topic of interest to you. Included are biographies of some respondents and the news release explaining this project. A global, low-cost network? Survey participants were asked to respond to the following scenario: By 2020, worldwide network interoperability will be perfected, allowing smooth data flow, authentication and billing; mobile wireless communications will be available to anyone anywhere on the globe at an extremely low cost. English displaces other languages? Survey participants were asked to respond to the following scenario: In 2020, networked communications have leveled the world into one big political, social and economic space in which people everywhere can meet and have verbal and visual exchanges regularly, face-to-face, over the internet. English will be so indispensable in communicating that it displaces some languages. Is autonomous technology a problem? Survey participants were asked to respond to the following scenario: By 2020, intelligent agents and distributed control will cut direct human input so completely out of some key activities such as surveillance, security and tracking systems that technology beyond our control will generate dangers and dependencies that will not be recognized until it is impossible to reverse them. We will be on a "J-curve" of continued acceleration of change. Does transparency build a better world, despite the loss of privacy? Survey participants were asked to respond to the following scenario: As sensing, storage and communication technologies get cheaper and better, individuals' public and private lives will become increasingly "transparent" globally. Everything will be more visible to everyone, with good and bad results. Looking at the big picture - at all of the lives affected on the planet in every way possible - this will make the world a better place by the year 2020. The benefits will outweigh the costs. Is virtual reality a drain on society? Survey participants were asked to respond to the following scenario: By the year 2020, virtual reality on the internet will come to allow more productivity from most people in technologically-savvy communities than working in the "real world." But the attractive nature of virtual-reality worlds will also lead to serious addiction problems for many, as we lose people to alternate realities. Does the internet open worldwide access to success and alter social groupings? Survey participants were asked to respond to the following scenario: In the current best-seller "The World is Flat," Thomas Friedman writes that the latest world revolution is found in the fact that the power of the internet makes it possible for individuals to collaborate and compete globally. By 2020, this free flow of information will completely blur current national boundaries as they are replaced by city-states, corporation-based cultural groupings and/or other geographically diverse and reconfigured human organizations tied together by global networks. Will more go "off the grid" and will some Luddites commit terror acts? Survey participants were asked to respond to the following scenario: By 2020, the people left behind (many by their own choice) by accelerating information and communications technologies will form a new cultural group of technology refuseniks who self-segregate from "modern" society. Some will live mostly "off the grid" simply to seek peace and a cure for information overload while others will commit acts of terror or violence in protest against technology. Setting priorities for the development of global information systems - Participants were asked to rank four different priorities for developing the world's information and communication technologies in order of importance. Most selected building the capacity of the network and passing along technological knowledge to those currently not online. > Use this link to download the full report in PDF format. > Use this link to read the news release about the 2006 Predictions Survey. > Use this link to read brief biographies of hundreds of key survey respondents.